I was in Fayetteville over the weekend, and decided to swing by the University of Arkansas campus before heading towards home. I went by Old Main, the building that is the landmark of the U of A campus. 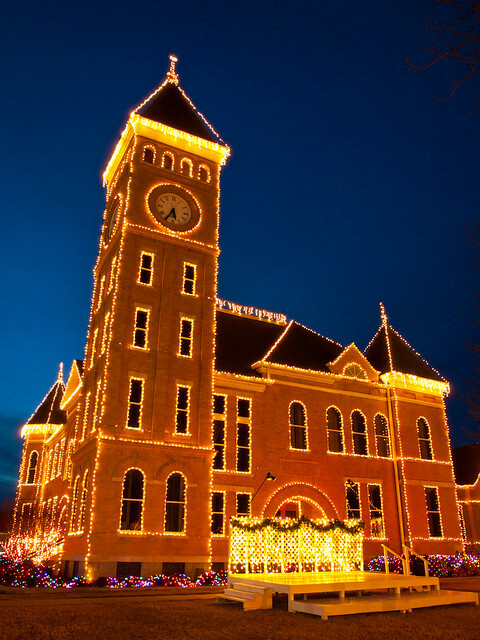 It has some Christmas lights on it, and the plan was to get a few pictures of Old Main with the lights aglow. So before dusk I staked out what I thought might be a good spot, and then waited for it to get dark. It was a bit chilly outside, so I waited in the cold for the lights to turn on. But after waiting for over an hour, they never did flicker on. So I left without any pictures of the Christmas lights. 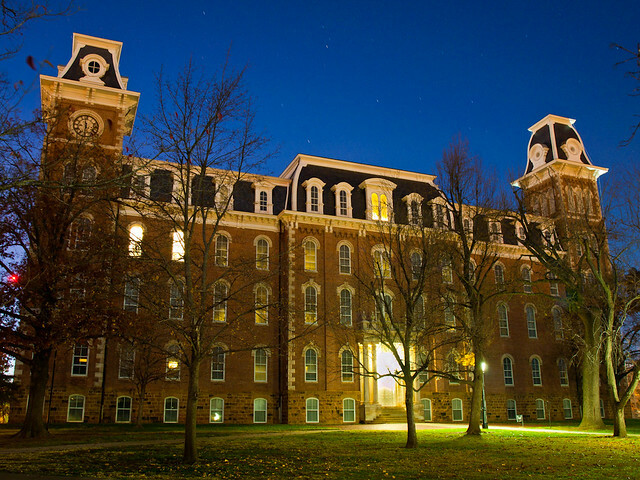 But did get this shot of Old Main (built in 1876), at dusk. 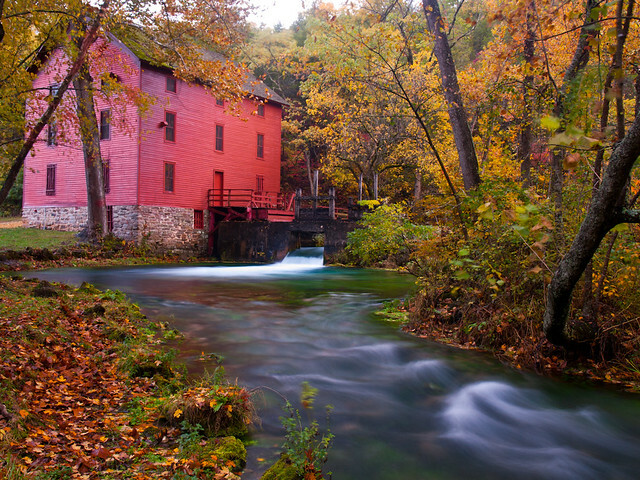 Since I was driving through North Little Rock on Sunday, I decided to swing by The Old Mill to see what the fall colors were like there. 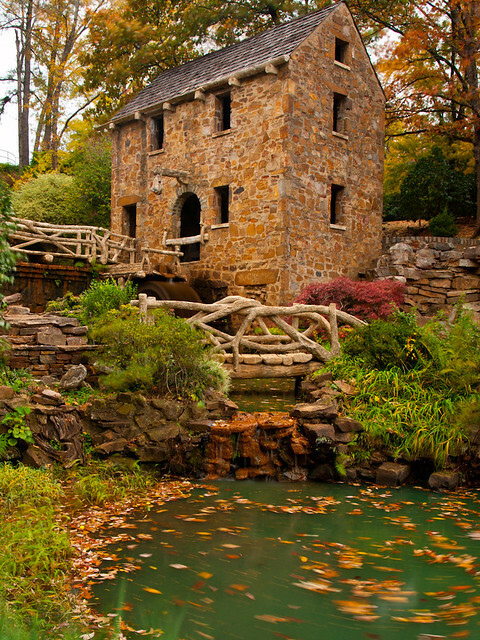 The Old Mill is probably the most popular spot in NLR, and is usually crawling with people like ants at a picnic. It was cloudy and rainy on Sunday, which I hoped would cut down on the crowds some. I pulled up to the park and there were a line of cars there. 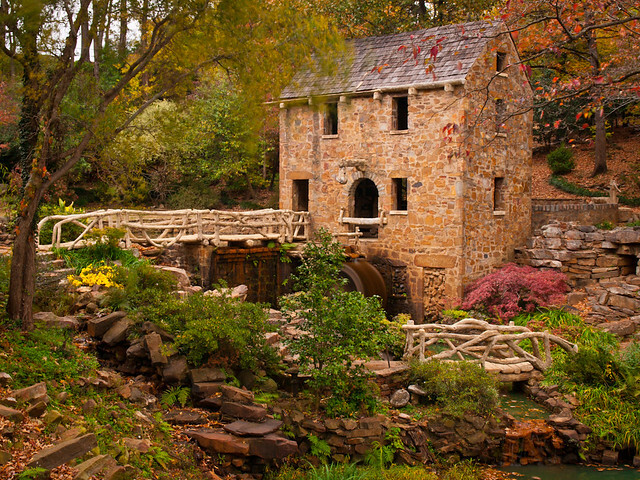 There had just been a wedding at the Mill, but it was over and the crowd was leaving. I was surprised to see just a few people left at the Mill. 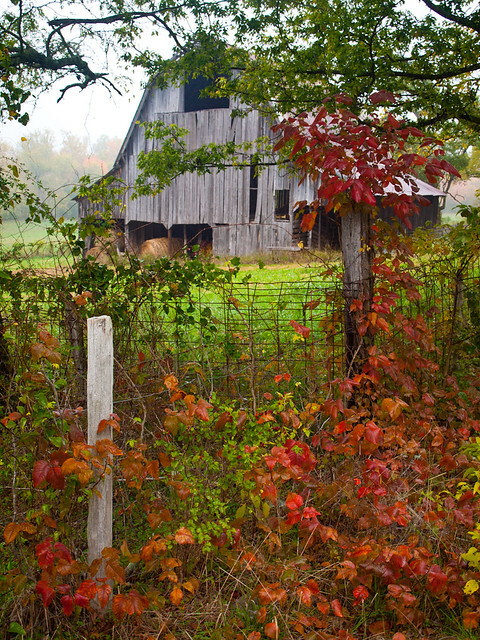 The fall colors were great, although the wind was steadily knocking the leaves off the trees. 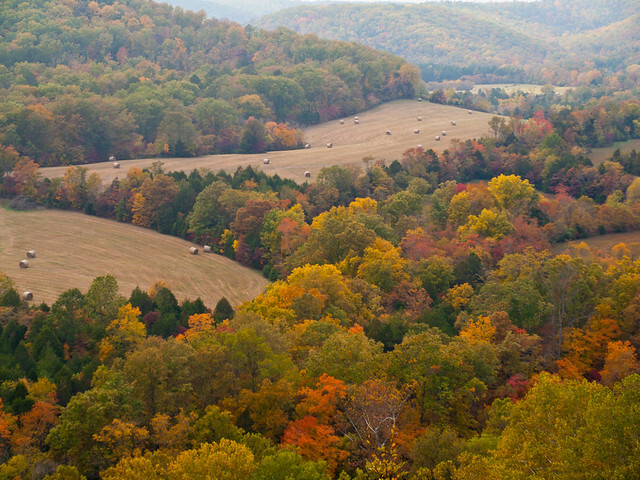 The fall colors this year have been spectacular, which is amazing since we had such a dry and hot summer. The colors are at peak in central Arkansas, so I headed out to try to get a few pictures before they all fall of the trees. I met up with Zack and John, and we drove out towards the Delta. 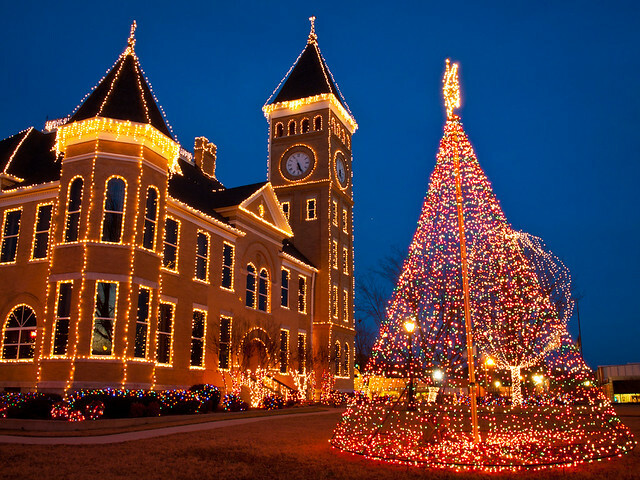 The first stop was the small town of Scott, which sits about 30 miles east of Little Rock. 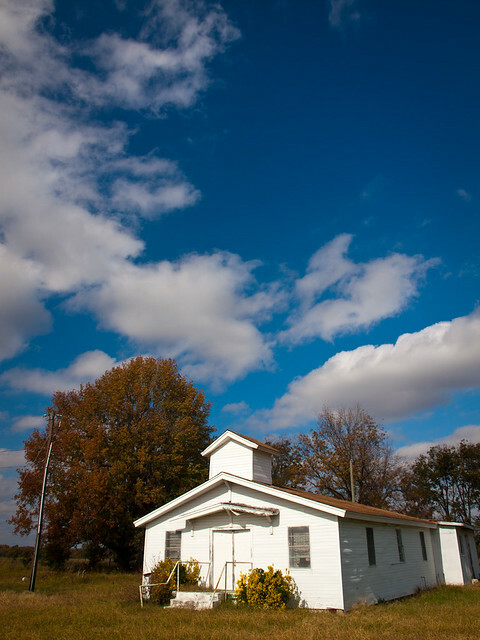 Scott is a huge contrast to the city; the small town is surrounded by farms and fields, and a few old plantation homes nearby. 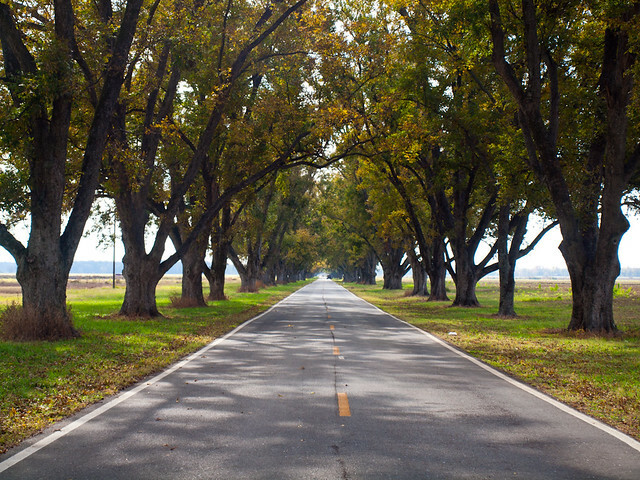 One of the most popular areas around Scott is Pecan Alley, where old pecan trees line the sides of the road. It's a really neat spot, but I think I spent more time eating pecans than taking pictures. I'm not really a big pecan fan, but the ones there were delicious. We drove along the road, passing by this abandoned old church. From there we headed back to Scott and got lunch at Cotham's, the local burger place that was shown on "Man vs. Food" a few years back. The burger was just as good as the atmosphere there, although I wasn't brave enough to order the hubcap burger. After lunch, it was back into the car. We drove further east, deeper into the Delta. It is amazing how much the landscape changes after driving just a little bit. 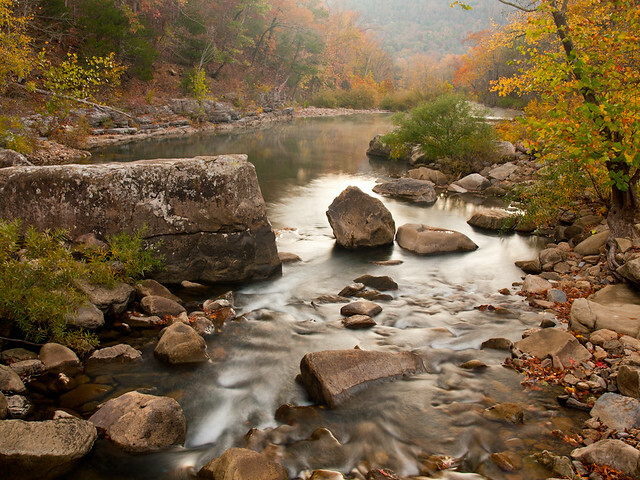 Little Rock sits in the rolling foothills of the Ouachita Mountains, but just heading about 50 miles puts you in the flat expanse of the Delta. The last stop that day was the Dagmar Wildlife Management Area, near Brinkley. 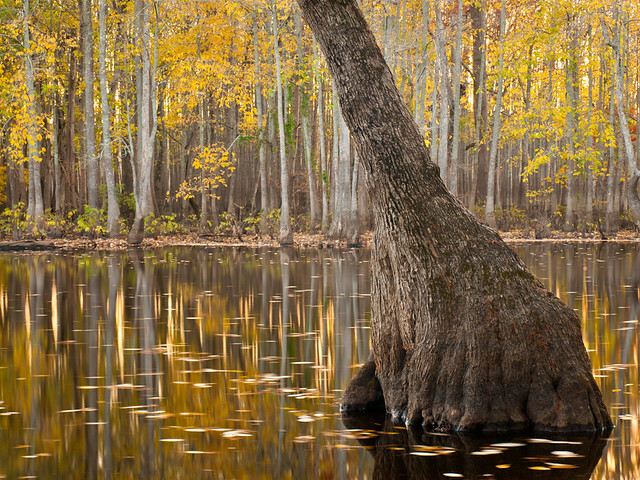 The WMA preserves nearly 8,000 acres of bottomland hardwood forests, streams, ponds, lakes and bayous. 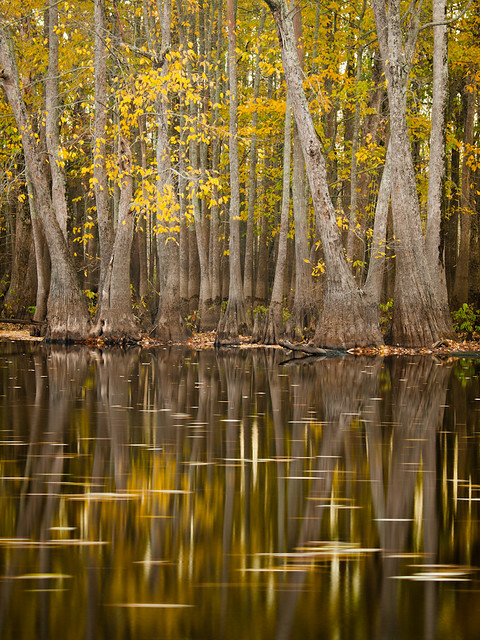 The real highlight of the WMA is Hickson Lake, which can be easily reached by the dirt road that runs through the WMA. The road is in pretty good shape, although it did kick up some rocks that made ominous noises as they bounced around my car's undercarriage. 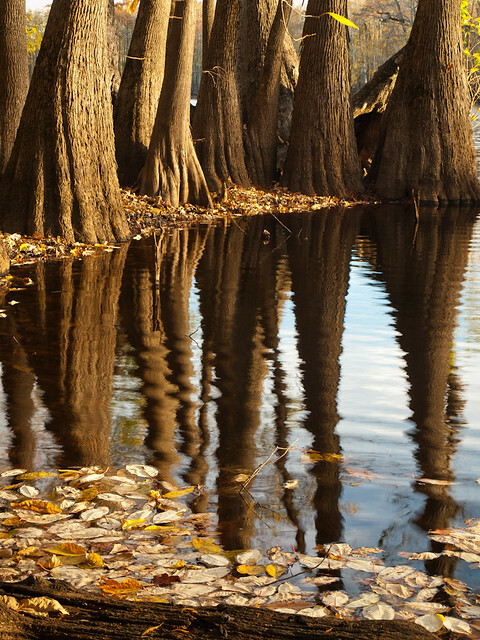 The shores of Hickson Lake is lined with thousands of cypress and tupelo trees. Some of the trees are massive, in fact there are trees in the area that are thought to be over 1,200 years old. 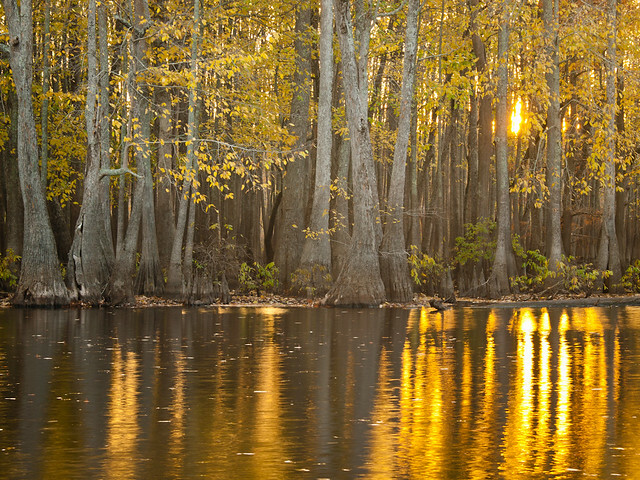 The sun began to set, and the light began to slice through the trees along the opposite shore of the lake. And one last shot, taken around sunset. The streaks in the water are leaves getting pushed around by the wind. 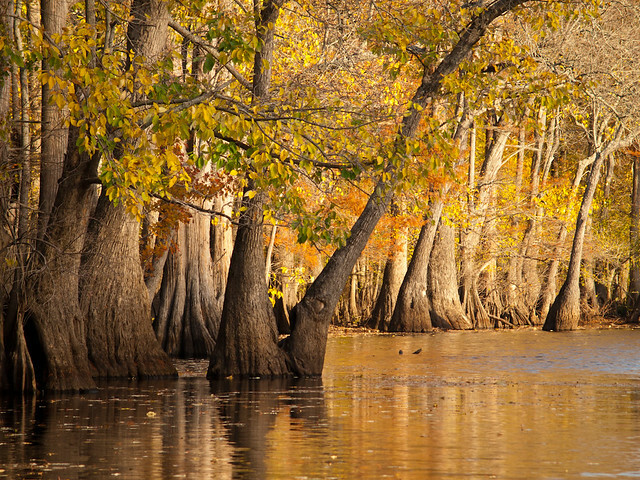 The Wildlife Management Area is run by the Game and Fish Commission. It's a popular spot to hunt, which meant there were a lot more hunters out there than photographers. We began to hear more and more gunshots in the woods around us, but luckily (or hopefully) they were aiming at something else besides three people with cameras. We left as it got dark, and got some good BBQ from a place in De Vall's Bluff, and then made our way on back towards Little Rock. 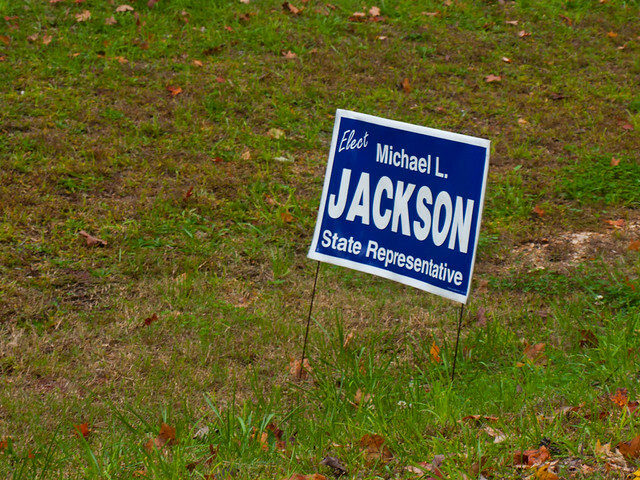 This reminded me of a sign I saw in 2008, up in northern Arkansas. 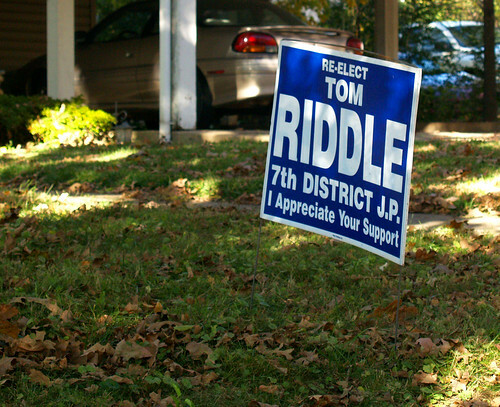 I definitely wouldn't vote for him, since he turned into Lord Voldermort. But speaking of Presidents, I'm going to post one more photo. This is an oldie, taken way back in the 1980's. When I was in the 3rd grade, one of our class projects was to do a report on a president. I ended up doing a report on Abraham Lincoln (my research did not cover the fact that he was a vampire hunter). But the twist on the assignment was that on the day that the report was due, we would each dress up as the president we studied. I lucked out on this, since a Lincoln costume would be much easier than say, Franklin Pierce or Herbert Hoover. All of the 3rd graders then took a field trip to the State Capitol, where we toured the building and got to meet the governor. 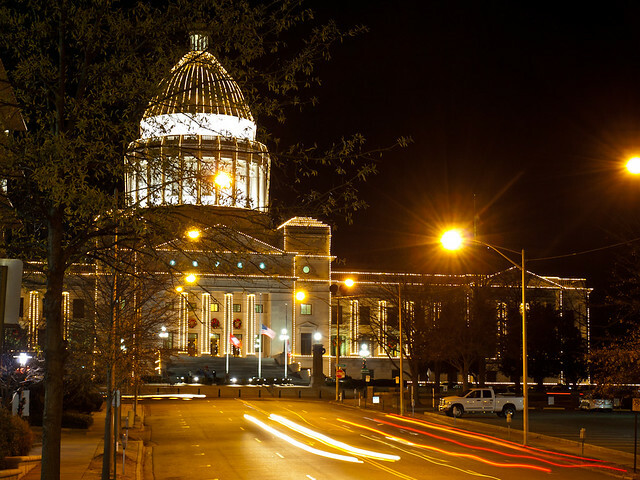 And since this was Arkansas in the 1980s, the governor was a politician that you might have heard of - Bill Clinton. 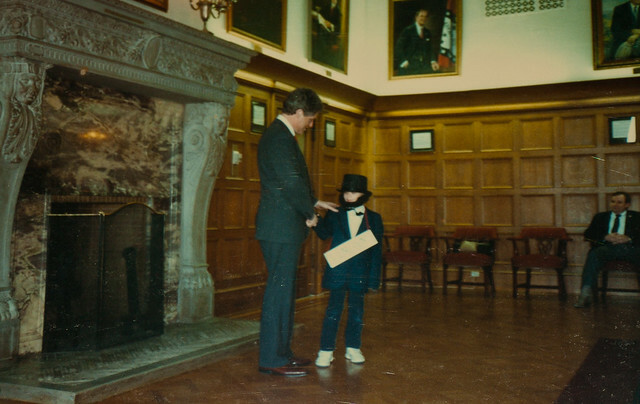 So this is me, dressed as a tiny Abraham Lincoln, shaking hands with a future President. As you can tell, my outfit was very historically accurate (Lincoln wore white tennis shoes, right?). 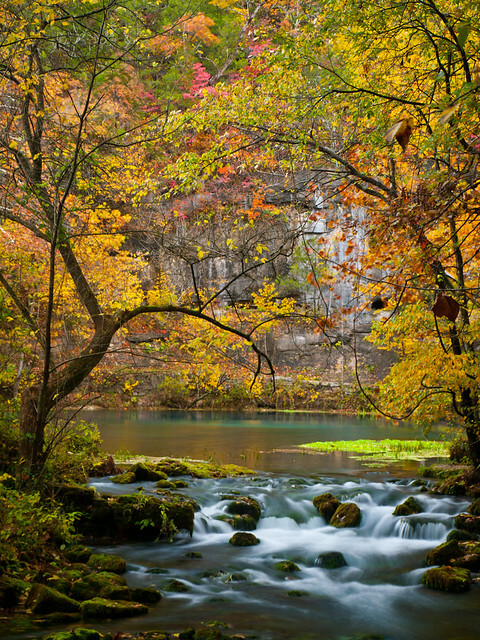 Work was generous and let me take off early on Friday, so I left Little Rock and drove up into the Ozarks. The autumn colors are close to being at peak (or past peak in some places, apparently), so I wanted to take a few pictures before the leaves fall off the trees. 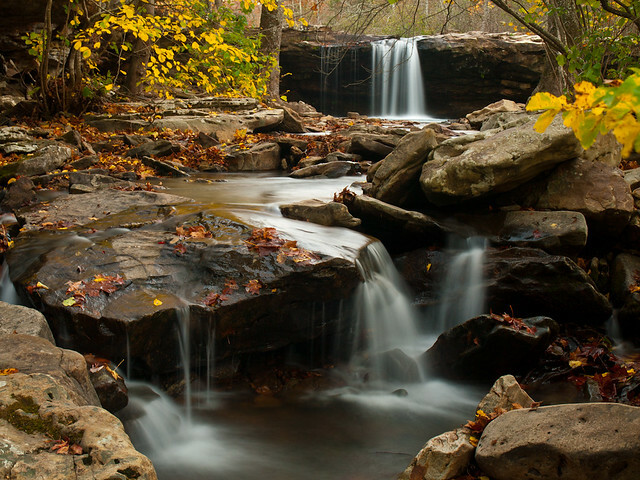 The first stop was Haw Creek Falls, which I hoped would have some water in it. And well, there wasn't much there at all. But after the bad drought we've had this year, it's amazing that there is even water in any waterfalls right now. It was getting close to sunset, and the light from the sun was hitting the trees right above the falls. As I walked up to the falls, I saw a bunch of fallen leaves caught up in the current below the falls. In the dying light of the day, I did a long exposure (15 seconds) to try to get the leaves showing up as a blurry swirl. 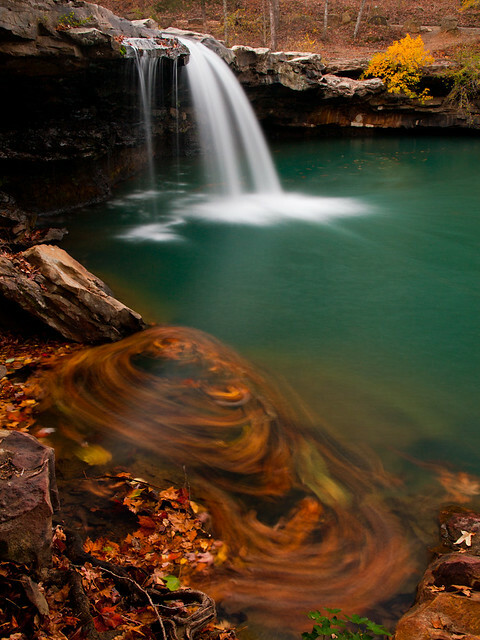 So here are a bunch of fallen leaves, below Falling Water Falls, along Falling Water Road, taken in the Fall. I stayed out there until it was nearly dark, and made it back to the car for the short drive to Richland Creek. I camped at Richland overnight, and woke up in the chilly morning air to take a few more pictures. According to the thermostat in my car, it was 34 degrees outside on Saturday morning. 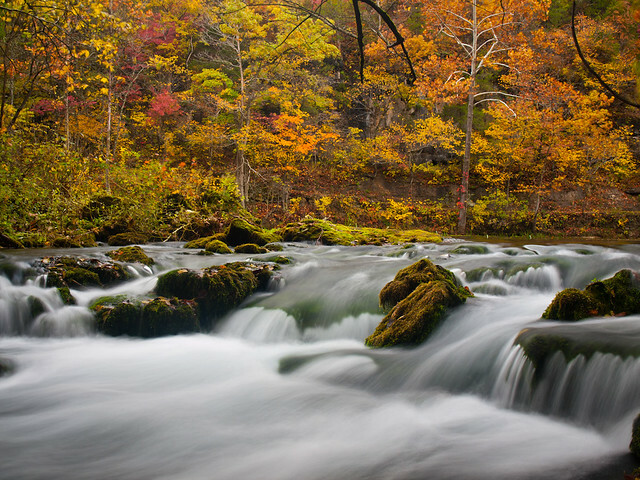 This is Richland Creek, with a bit of mist along the creek. I was startled by a loud splash as I walked along the creek, which must have been from one of the resident otters there. After scraping the frost from the car's windshield, I headed back down Falling Water Road. I stopped at Six Finger Falls and took a few pictures, but the water was low there and they didn't really turn out. I stopped at Falling Water Falls, just before the sun rose over the hills, for a few more pictures. And so the journey continues. 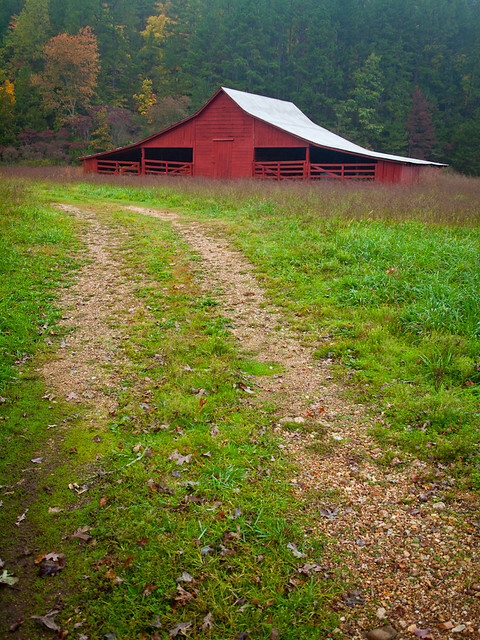 From Alley Spring, we headed south towards home, passing through the Mark Twain National Forest. We had a few stops planned, taking us a by a few other springs before we traveled back into Arkansas. 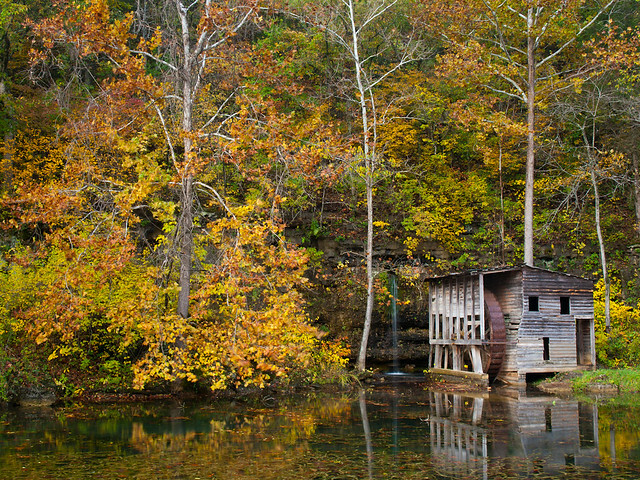 The first was Falling Spring Mill, located a few miles down a dirt road. The mill was built between 1927 and 1929, although it isn't used anymore. 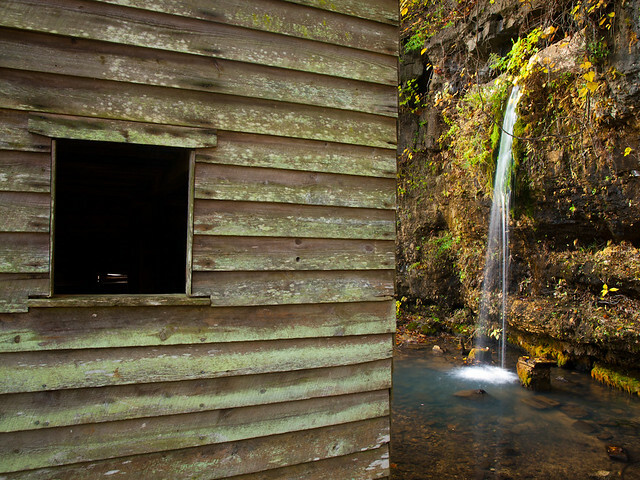 Here is a shot of the falls pouring out from behind the mill. From there we drove over to Greer Spring, and started on the mile long hike to the spring. The trail switchbacked through the forest, and eventually dropped down to the creek formed by the spring. 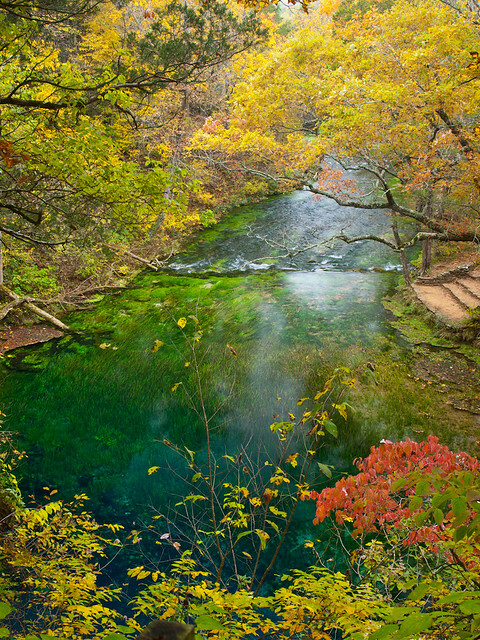 Greer Spring is the second largest spring in the Ozarks, and in Missouri. 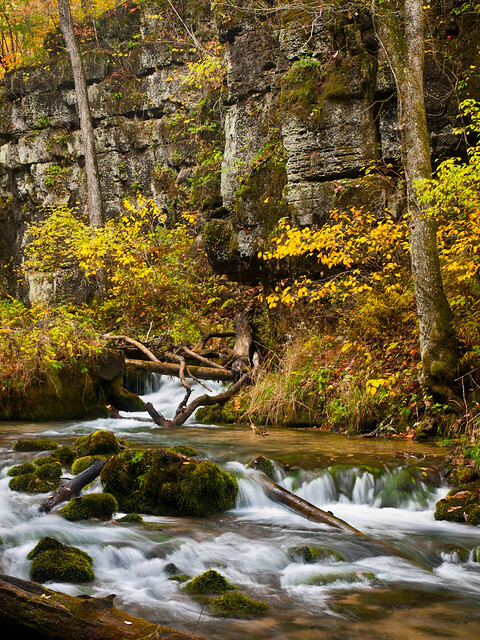 222 million gallons of water bubble up from the spring, and then flow into the nearby Eleven Point National Scenic River. From there we headed on home, and soon crossed over the border into Arkansas. 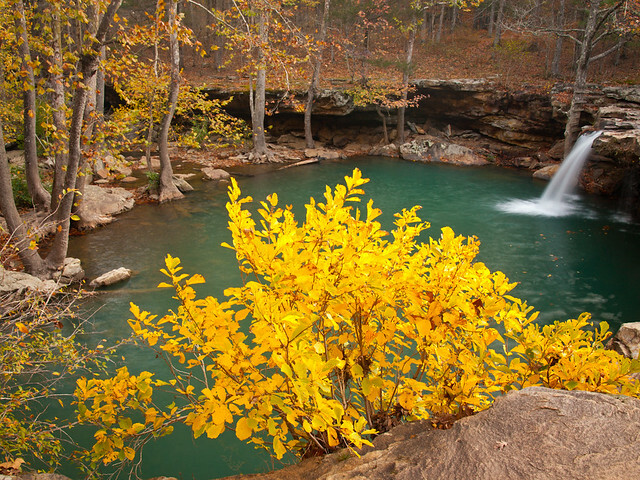 We drove by Mammoth Spring, which is the 3rd largest spring in the Ozarks. We didn't stop, but we could see it from the road. 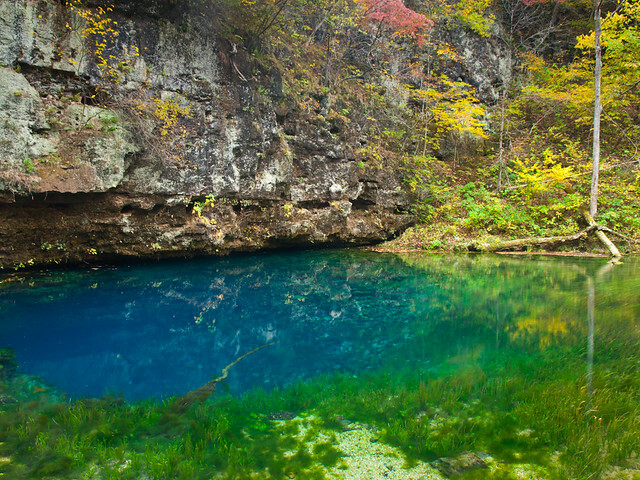 So with Mammoth Springs, we actually ended up hitting 7 of the 15 largest springs in the Ozarks that weekend. We drove further south, through Batesville and towards Searcy. Just about a minue after Zack commented that we were making good time on our drive home, I got a flat tire. After driving down miles of dirt roads that weekend, the tire finally had enough. We pulled over in someone's driveway, and put on the do-nut spare. We were still a good distance from home, so I decided to drive to the only place around that would be open on a Sunday that could put on a new tire - Wal-mart. So we slowly wobbled into the Searcy Wal-Mart, only for the associates there to rudely inform us that it would be a three and a half hour wait. I thought that Zack probably had better things to do with his day than sit around for hours while I got a tire fixed (or was probably tired of being around me), so we decided to just go ahead and drive back to Little Rock. 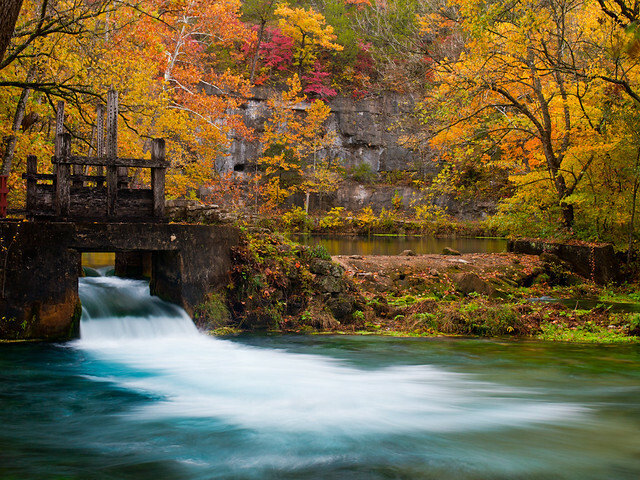 From Blue Spring, we got back into the car and continued our tour of the Ozark National Scenic Riverways. Along part of the drive, we followed a road as it traveled up the side of a hill, providing this view of the valley below. The next stop was Welch Spring. 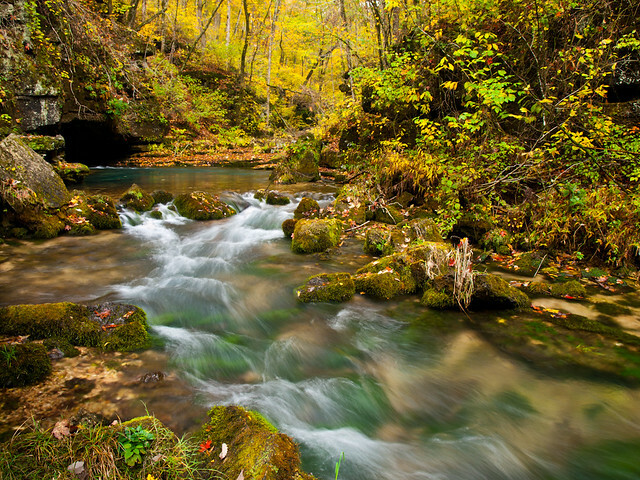 After a short hike along the Current River, we came up to Welch Spring, which is the 9th largest spring in the Ozarks. 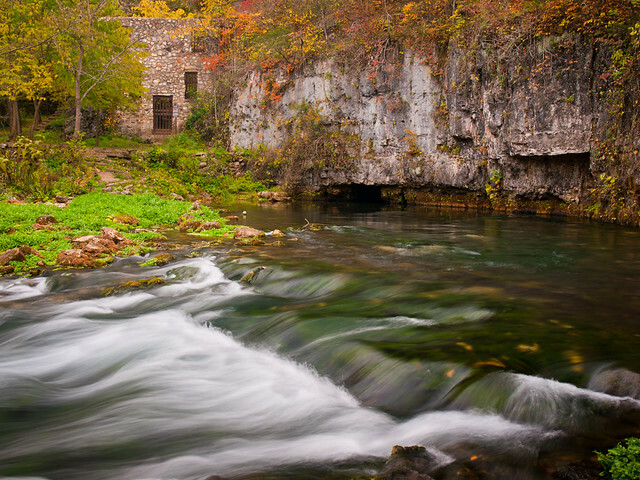 About 105 million gallons of water flow out of the spring, next to the ruins of a hospital that was built in 1913. 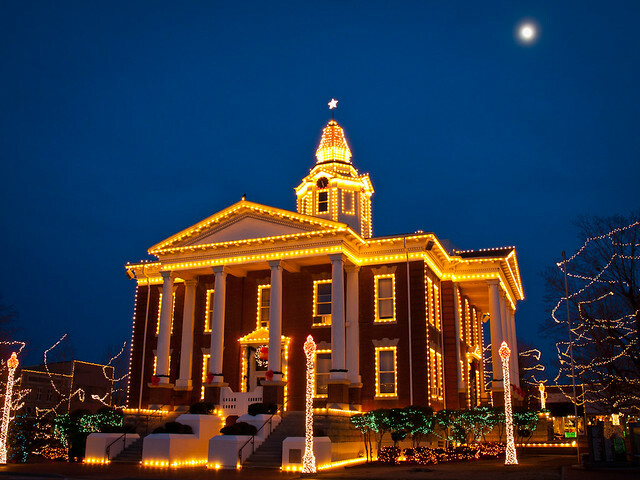 Next we drove into the small town of Eminence to get something to eat. During the whole trip we had barely seen any other people. There were maybe a handful of people around Blue Spring and Welch Spring, but most of the time we had the springs all to ourselves. So we naively deluded ourselves into thinking that it would be like that the whole weekend. If I had a dollar for each time one of us said "This is amazing, where is everyone?" than we'd, well, have a bunch of dollars. Which would have been nice to help pay for all the gas we burned to get up to Missouri. The plan was to drive up to Alley Springs, which is one of the more popular spots in the park. We had assumed it would be nearly empty, like all the other spots we have been to over the weekend. We were wrong. As we got close to the park, there were signs along the road warning: "Heavy Traffic. Haunting Event Ahead." What? Well it turns out that the National Park Service was hosting the "Haunting of the Hills" that day. The park at Alley Springs was packed with people, with park rangers directing people to over-flow campgrounds and parking. Well, so on to Plan B. 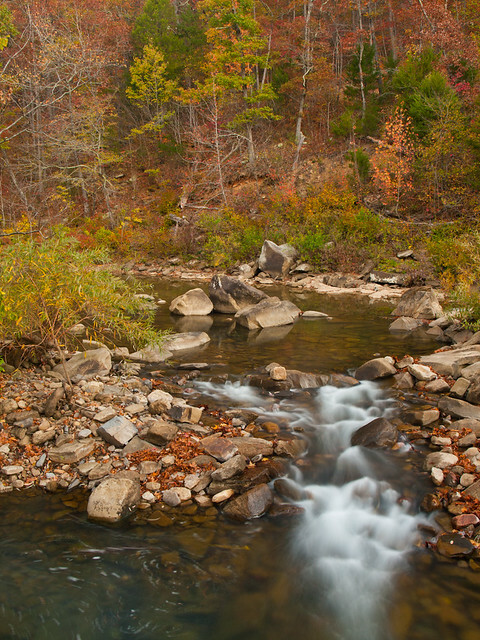 We drove on to the closest campground, at Bay Creek along the Jacks Fork River. The campsite was nice, but the most scenic part was the drive through the woods on the way there. 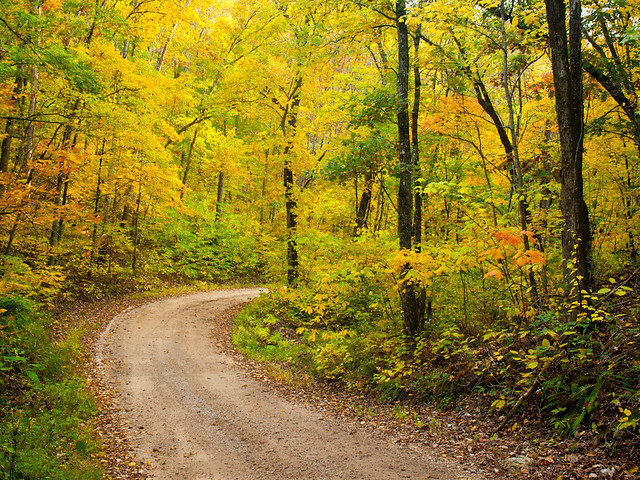 The fall colors were breathtaking, I think I stopped the car about every five feet to take pictures of the road and the woods. A heavy storm passed through the campsite around one in the morning, which made me glad I wussed out and slept in the car instead of my not-so-waterproof tent. But we managed to wake up before dawn again, and headed back to Alley Springs. The park was silent and still, with a few tables set up from the Haunting of the night before. Alley Spring was probably one of the prettiest places we visited on the trip. 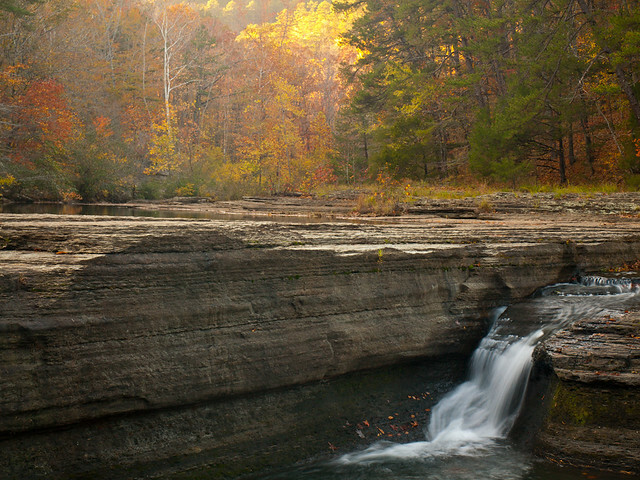 The spring (the 8th largest in the Ozarks) pours out from the base of a limestone bluff. 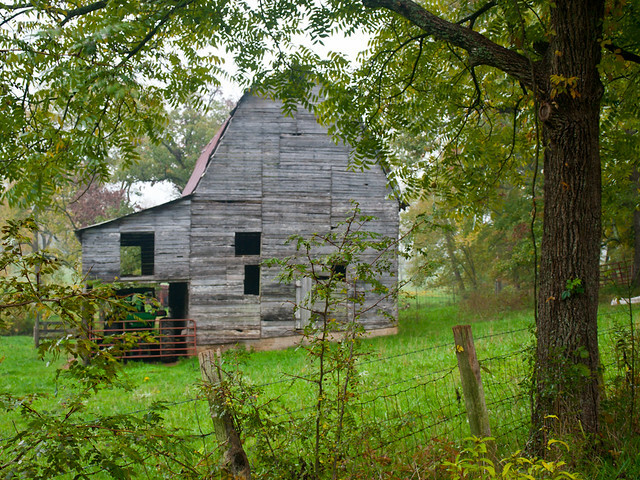 Next to the spring is the old Alley Mill, which was built in 1894. Here is the pool formed by the spring, where an average of 81 million gallons of water stream up from the ground every day. The water was a deep and emerald blue. This was taken from the mill, where the water has been diverted through this chute. 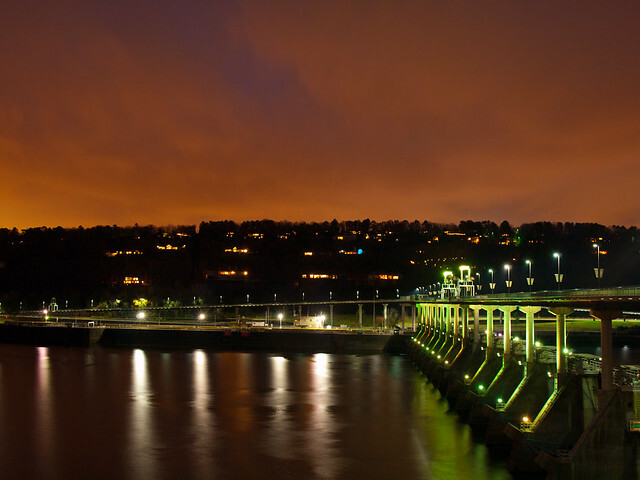 The water turned a turbine, which was used to process grain back in the olden days. Here are a few more shots from around Alley Spring. This place was gorgeous, definitely worth the wait. Here's a shot of where the water shoots out from under the mill. 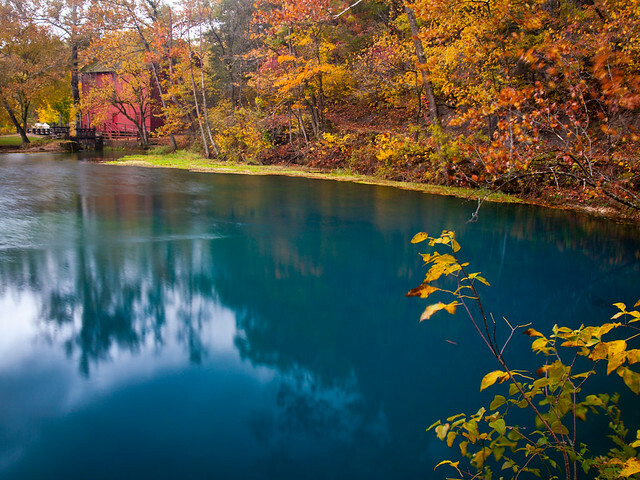 It was neat to see the deep blue of the spring water and the fall colors here. 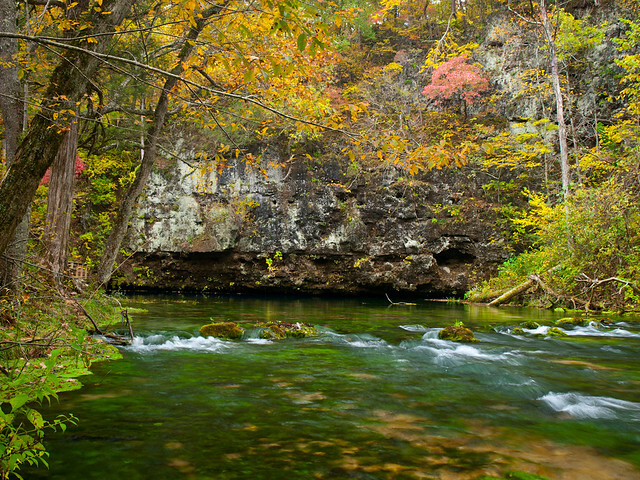 From Big Spring, we headed out to another of the many springs around the Ozark National Scenic Riverways. It didn't look like it was very far away on the map, but there wasn't a direct route to the spring, so it required a bit of a drive. 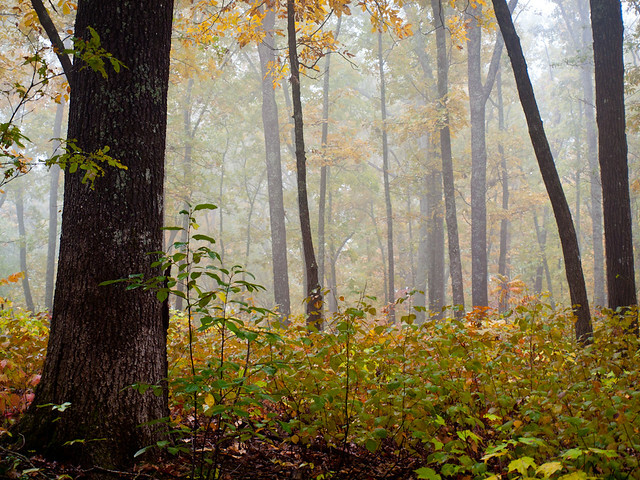 But that was ok, it was still foggy and the fall colors were still vivid. 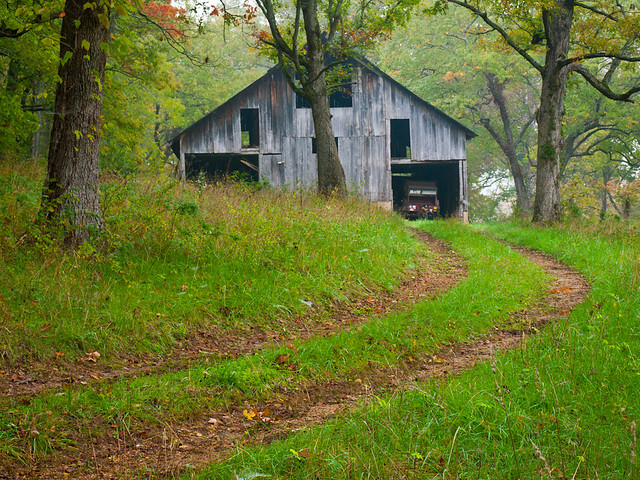 And it helped that there were a ton of old barns along the way. 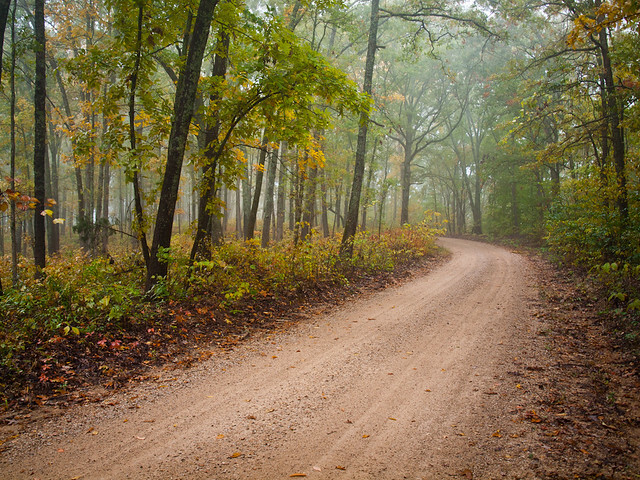 We turned off of the paved road onto a well-maintained dirt road (which was nice, since we were in my little Pontiac). 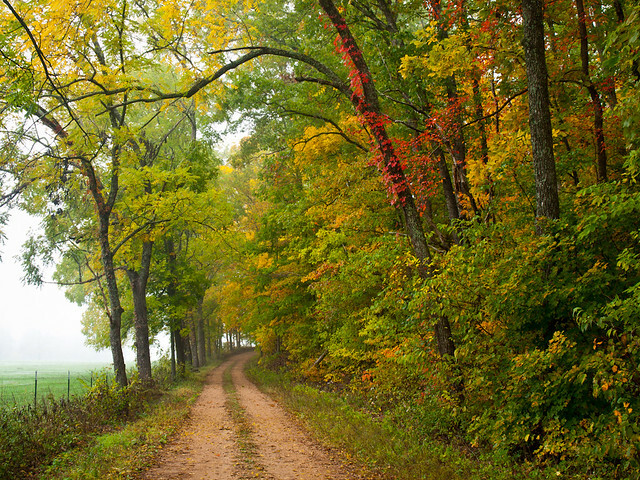 The road passed by a few homes, but it was mostly woods and a few fields. The fog was still thick. We were both amazed that we somehow managed to get up there when the conditions were just about right. 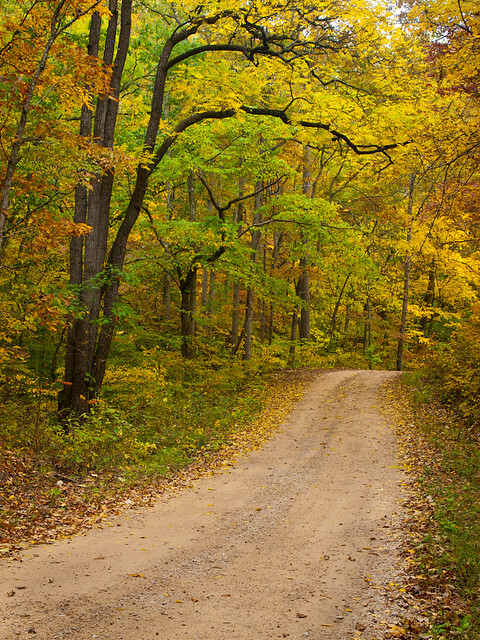 Eventually, we found the road that went down the hill towards Blue Spring. I was thrilled that it was still foggy. The fog really brought out the fall colors. So much, that I was worried that they'd look too saturated in the pictures. But the fog wouldn't last for too much longer, sadly. By the time we got to the parking area for Blue Spring, the fog had burned off and the sun was threatening to break through the clouds. But we headed off on the short trail to Blue Spring, which as the name suggests, is quite blue. 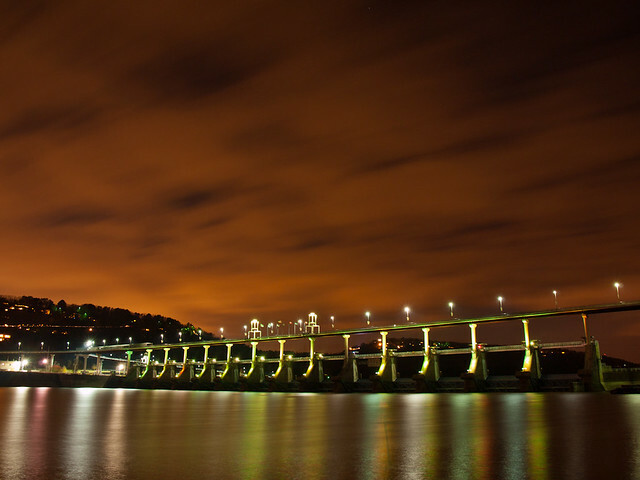 The Osage called this the "Spring of the Summer Sky," which is a better name, much more poetic. The vivid blues are the result of both the suspended particles of limestone and dolomite in the waters, and for the depth of the spring's conduit (nearly 300 foot deep). It was a beautiful spot, but kinda hard to convey in a photograph. 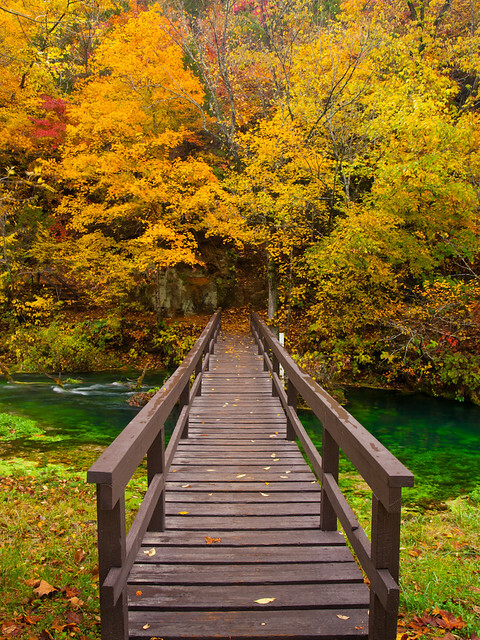 There is a wooden walkway that extends out over the spring, where you can look down into the spring. The rocks there head steeply down, disappearing into the inky blue waters. This is the view from an overlook on the bluff above the spring. 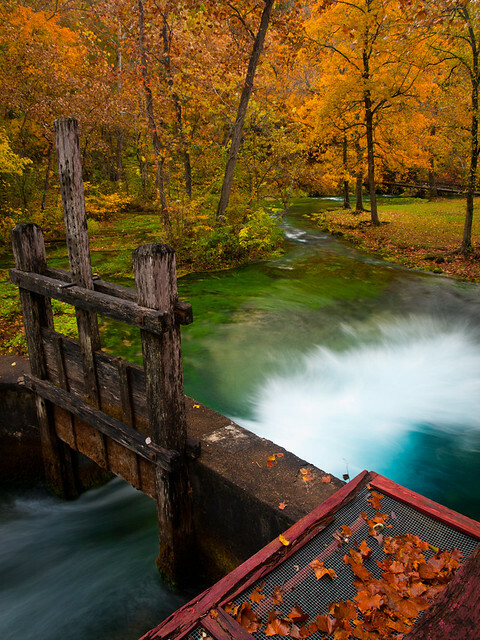 Blue Spring is the 6th largest spring in Missouri, with an average outflow of 90 million gallons a day. The spring water flows into the nearby Current River.